All TEB Sh.A. clients are notified that the main branch of the city of Prizren has moved to a new location. Dear Customer, through this announcement, we will notify you about the update of the service fee of TEB Sh.A, which will enter into force on January 22, 2019. "Do the work now" offer continues from the most familiar banking card in Kosovo, Starcard, which helps you in planning your purchases. TEB Sh.A. has continued for two years the sponsorship with Football Federation of Kosovo (FFK) and Basketball Federation of Kosovo (BFK). 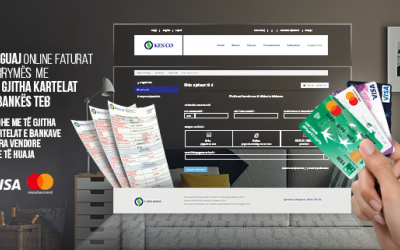 "Do the work now" is the latest offer from the most familiar banking card in Kosovo, Starcard, which helps you in planning your purchases. Pass over your salary to TEB and get over 20 services with €0 expenses! Special offer with many free banking services for all new clients who receive their salaries through TEB Bank Sh.A. 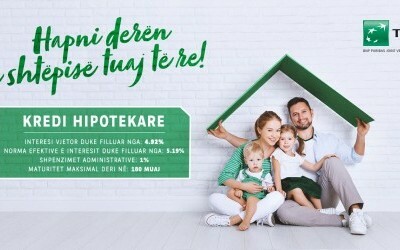 New campaign of TEB Bank for individual loans. Benefit discounts on administrative expenses by applying for a loan through TebMobile. 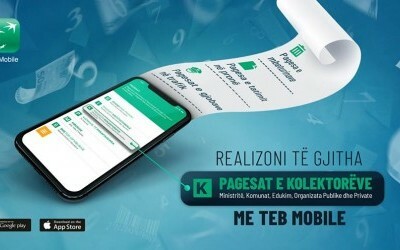 TEB Bank extends the campaign through TEB Mobile application by offering discounts on administrative expenses and bonus if you apply for loan products or perform national transfer. TEB Bank offers new opportunities for international money transfers to individual clients through e-banking platform. TEB Bank brings the latest offer to businesses that want to accomplish their plans in a short-term. Apply for loan through TEB Bank, TebMobile app, and benefit from preferential terms. Apply for a loan through TebMobile app and benefit from preferential terms. Dear Client, through this announcement, we inform you that changes on the price list of TEB Sh.A Bank services will take effect on 22 of September 2018. For the fourth time at the final of the most prestigious tennis tournament in Kosovo triumphed Granit Bajraliu from Pristina. TEB Sh.A. Bank management has inaugurated the launching of operations in a new branch in Vitia, expanding thus the network of new branches to server the customers. The Eid-al Fitr loan is back to all users of TEB Bank application, TebMobile. Many attractive banking offers of TEB Bank through smartphone application, TebMobile. The newest offer of TEB Sh.A. of some free products for new business clients of Kosovo. TEB Sh.A. have inaugurated the start of the new Digital Branch in the city of Pristina, continuing expansion with new service points for clients. TEB Bank Sh.A., in the scope of providing the most advanced products to its clients, is developing its network of continuous card payments. €5 million loan to Kosovo bank TEB under the Western Balkans Green Economy Financing Facility. We continue further with the most attractive offer for farmers and agribusiness funding. TEB Bank Sh.A. comes with the newest consuming offer. Get up to 30,000€ loan WITHOUT CO-BORROWER. TEB Bank Sh.A. comes with the newest consuming offer. Get 10,000€ loan and pay only 4.85€ per day. WITHOUT CO-BORROWER, WITHOUT GUARANTOR AND WITHOUT COLATERAL. TEB Bank Sh.A. comes with the newest consuming offer. Get 5,000€ loan and pay only 2.45€ per day. WITHOUT CO-BORROWER, WITHOUT GUARANTOR AND WITHOUT COLATERAL. On occasion of International Woman's Day 8th March, TEB Bank Sh.A. in cooperation with EBRD (European Bank for Reconstruction and Development) organized a seminar on women in business. TEB Bank Sh.A. today has received important acknowledgment from the President of the state on the eve of the 10th anniversary of Kosovo's independence. 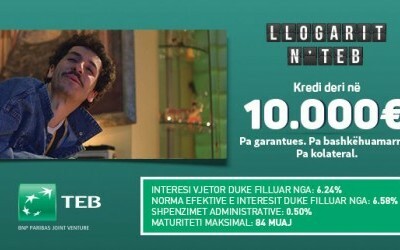 New loan offer from TEB Bank. WITHOUT CO-BORROWER, WITHOUT GUARANTOR AND WITHOUT COLATERAL. The newest TEB Bank offer for all employees who receive salaries in cash! Loans up to 30,000 Euro without mortgage. TEB Bank Sh.A. has been announced among the 15 largest taxpayers for this year by the Kosovo Chamber of Commerce. ATM Top Up –New Opportunity TEB Sh.A. TEB Bank Sh.A. offers the new opportunity for its customers named ATM Top-Up through which you can top-up your phone across all TEB Bank ATMs throughout Kosovo. 3.000 Euro loan for only 2.99 Euro per day. The most well-known bank card in Kosovo comes with a new offer of purchases for its users. TEB Bank Sh.A. for the third year in a row is affirmed the best Bank in Kosovo by The Banker, the Financial Times’ banking rating sector. TEB Bank Sh.A. congratulates the 28th of November Albanian flag day to all citizens of Kosovo. For the fifth time this year a seminar on "Women in Business" is co-organized by TEB Sh.A. and the European Bank for Reconstruction and Development (EBRD). In the scope of commitments for economic empowerment of woman, TEB Sh.A. attended the World Bank Summit organized by the Global Banking Alliance for Women (GBA) held in London. The Women's Business Association (SHE-ERA) in cooperation with Jakova Innovation Center organized a roundtable discussion entitled "Sharing Best Practices of Women Entrepreneurs", supported by TEB Bank Sh.A. From now on, electricity bill payments (KESCO) can also be made by sending a single SMS with mobile phones. The city of Mitrovica was the ninth host of the Business Academy organized by TEB Bank in the scope of non-financial services. Use the debit card overdraft service across ATMs in Kosovo and abroad. All TEB Sh.A. clients are informed that Mitrovica city branch has moved to a new location. TEB Bank and European Bank for Reconstruction and Development (EBRD) organized the Women in Business Seminar, on 11th October, in Gjakova. Owners and managers of various companies from the city and region of Ferizaj have benefited from the non-financial services organized by TEB Bank. TEB Bank and the European Bank for Reconstruction and Development (EBRD) on 28th September, organized the Women in Business seminar in Peja. Starcard individual users can take part in the awarding game of winning the big prize Harley Davidson motorcycle. On 3rd October 2017, TEB Bank will organize the "Business Academy VIII" in Ferizaj, in the scope of non-financial services for local companies. TEB Sh.A. Corporate branch has been displaced from Emshir area to a new location along the highway Pristina - Ferizaj. Seminar on Women in Business "How to expand your business?" TEB Bank and the European Bank for Reconstruction and Development (EBRD) are pleased to invite you to the Women in Business Seminar, which will take place on Thursday, 28th September from 09:00 to 13:00 hrs, at Dukagjini College in Peja. Take a loan of up to 30,000 Euros without mortgage with special conditions and additional benefits. With TebMobile all the banking services in one place. Businesses from Gjakova region benefit from "Business Academy VII"
Numerous companies from the city of Gjakova and surrounding have benefited from professional consultancy organized by TEB Bank. TEB Bank Sh.A. brings a special offer for farmers and agribusinesses in Kosovo which are recipients of Agro Grants. On August 16, 2017, TEB Bank Sh.A. will organize the "Business Academy VII" in Gjakova for local businesses. The Kosovo representation team in basketball has scored historical triumph in their first World Cup qualifier appearance, China 2019. TEB Bank will continue to support the Kosovo A Representation. Following the support provided last year during Eurobasket 2017 qualifications, this year also the Bank has decided to support the KBF in their pre-qualification phase for the 2019 Basketball World Cup in China. TEB SH.A. Bank management has inaugurated the start of operations of the new branch in the town of Ferizaj, thus continuing the expansions of new units to serve customers. Do not limit your dreams! Get a loan up to 30,000 EUR WITHOUT MORTGAGE. NO CO-BORROWER, NO GUARANTOR and NO COLLATERAL. 5,000 IS READY FOR YOU! TEB Sh.A. with the award "Best Bank in Kosovo" by Euromoney has increased the international success of the parent bank, BNP Paribas. Euromoney: TEB "Best Bank in Kosovo"
TEB Sh.A. has been named the "Best Bank in Kosovo" as of the professional rating of pre-eminent international financial magazine Euromoney. TEB Bank presents a new offer for diaspora with 0% COMMISSION for each transfer of deposits from all over the world to Kosovo. The latest cooperation between TEB Bank Sh.A. and Telecom of Kosovo brought listening of free fairytales by calling the number 0800 23000. TEB Sh.A and the European Bank for Reconstruction and Development (EBRD) continue with the series of non-financial services for women entrepreneurs. EBRD "Gender Award" for TEB Sh.A. TEB Bank Sh.A. continues with the support of women entrepreneurship, this time with the seminar in Pristina with the European Bank for Reconstruction and Development (EBRD) and Frankfurt School.